Somehow I always forget how ridiculously hot DC gets in July. Every year, it comes as a surprise that these temperatures are achievable, as I step out of my doorway and into a thick wall of humidity and heat. Perhaps I block it out like a bad memory. Of course this means that I want to spend less time over a stove when I’m inside, not to mention keep the oven off. So here’s a dish that you, or I, or anyone can make right now, in the middle of summer. 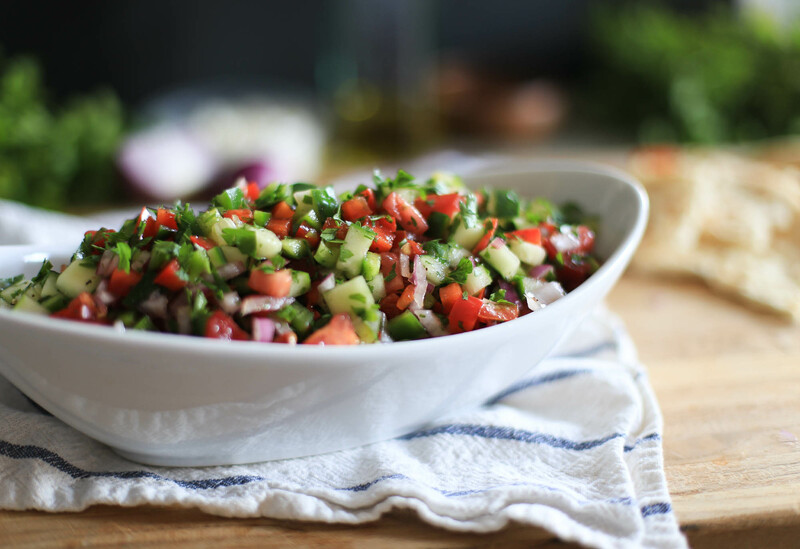 Israeli salad is refreshing, crunchy, and simple. 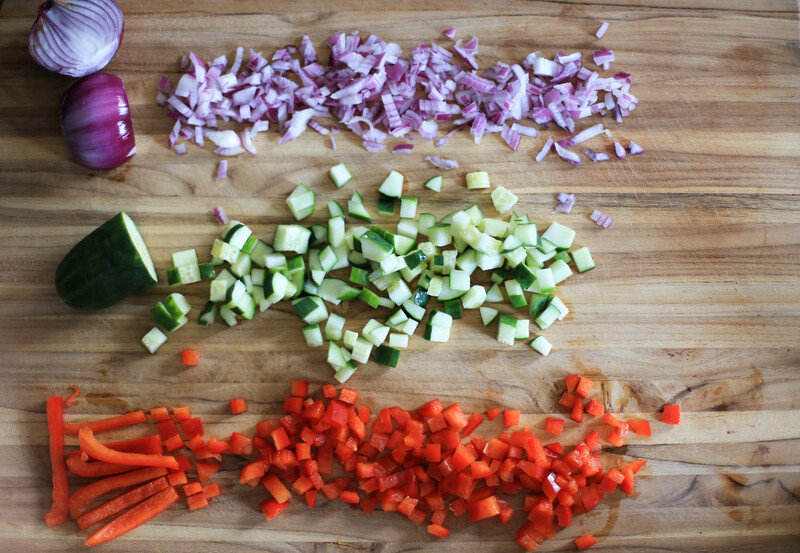 Dice up some fresh veggies, toss them with olive oil, salt, and vinegar, and enjoy. Absolutely NO cooking, thank goodness. 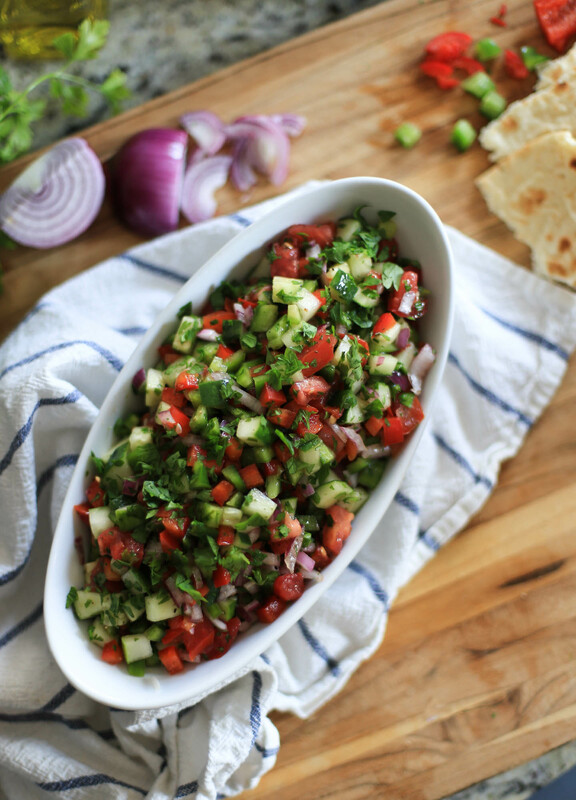 I stumbled across Israeli salad a couple of years ago, at a rare gathering of my husband’s extended family. A few cousins had traveled all the way from Israel, and I got to meet them for the first time. One of the kids said I looked like a princess, so he’s pretty much my favorite for life. We met up for a week at the beach, a week I didn’t want to end. Everyone took turns cooking meals, and one night Israeli salad was served. It turns out that my husband had eaten it often when he previously visited Israel, and loved the dish. My reaction was basically, “Wait a second, getting you to eat a bowl of fresh vegetables is this easy? !” So I’ve been making it ever since. 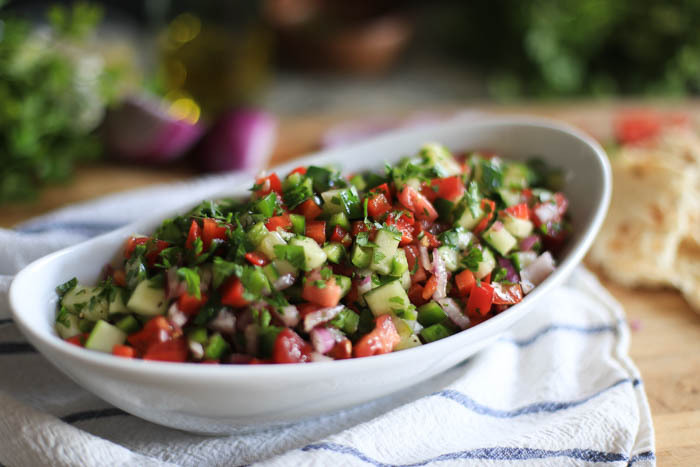 Israeli salad is so deliciously crunchy and colorful, you might not even notice that you are at that moment eating a healthy, low-calorie dish. 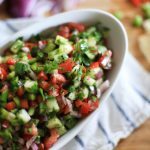 The salad is easy to make your own – for example sometimes I throw a handful of feta in, or use balsamic instead of apple cider vinegar. I usually serve the salad chilled so it’s more refreshing on the insanely hot days. Plus the longer it sits, the better it gets. 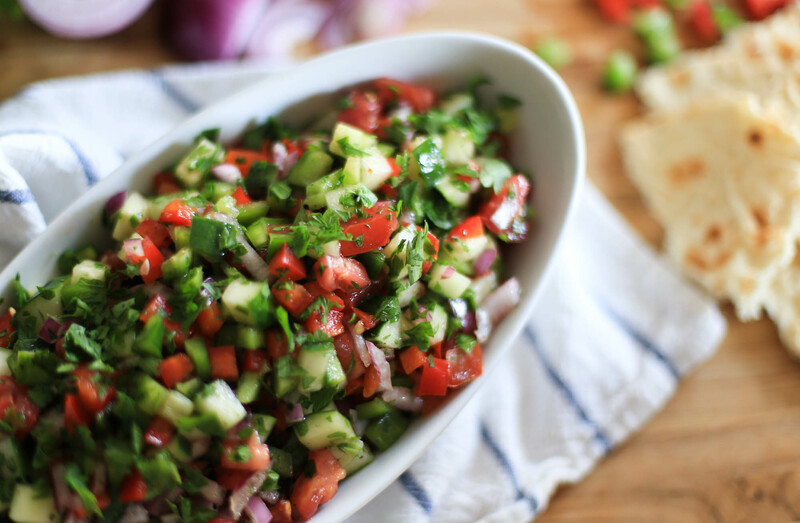 Israeli salad can be enjoyed on its own or as a side to kebabs, chicken, fish, you name it. We have it for lunch sometimes with hummus and pita chips. Hey, any way to sneak more veggies into the rotation. The salad is made up of finely chopped vegetables instead of leafy greens. Since it’s such a basic salad, the quality of the ingredients makes a big difference. The ingredients could come straight from your garden (if your thumb is greener than mine). If gardening is not for you, it’s still completely budget-friendly (bingo!). It’s got cucumber, tomato, bell peppers, and parsley, with a simple dressing of olive oil, vinegar (or lemon juice), and salt. Plenty of bold flavors packed in there, with fresh parsley to add a pop. So the heat is no longer an excuse for not making your own dinner at home. Stay cool friends. 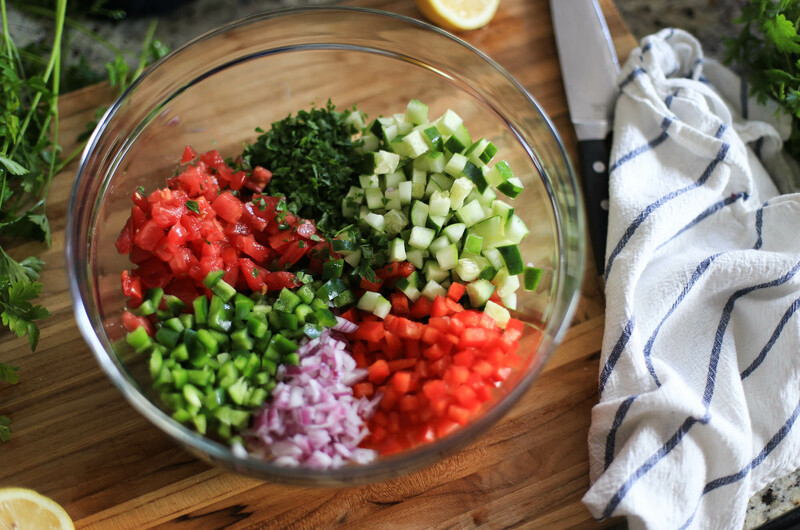 Combine the vegetables and parsley in a large bowl. In a separate bowl, whisk together the olive oil, vinegar, salt, and pepper. Drizzle the dressing over the vegetables and toss well to coat. Adjust salt to taste. Serve immediately, or place in the refrigerator for one hour to chill and serve cold. Serves 4-6, depending on whether the salad is served as a side dish or main. Add crumbled feta for another flavorful twist.